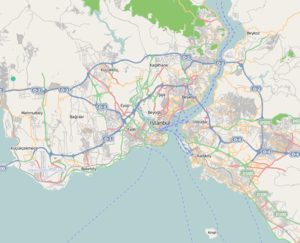 Bağcılar is a working class suburban district of Istanbul, Turkey. It is located behind Bahçelievler on the European side of the city, between the two major ring roads, the TEM and the E5. The mayor is Lokman Çağırıcı (AKP). Sparsely populated countryside at the time of founding of the Turkish republic, bağcılar means "vine growers" in Turkish and was known as "Yeşilbağ" (Green Vineyard in Turkish). But the district has been urbanized within the last decades. Most of the housing in Bağcılar was illegally built Gecekondu but has now been replaced by rows of cramped apartment buildings, also built with minimal regulation. It is a classic example of failed urban planning, perhaps exemplified by the fact that Bağcılar was not created as a district in its own right until 1992, by which time the original inhabitants had all left and building in the area was completely out of control. Bağcılar is now populated by recent immigrants from Anatolia, mostly young families, mostly poor, with many children. These people are struggling to survive in narrow streets of the most basic, undecorated buildings. There is little infrastructure to support the huge population, no parks, cinemas, and very few cultural or social amenities of any kind. Except one high profile white elephant: there are few trees in Bağcılar, but there is an Olympic Sports Complex. Also Bağcılar has been in the news recently as families in the area are failing to send girls to school. The local council is now trying to invest in parks, cafes and other amenities but the area is so full that there is little space. Bağcılar is a right-wing stronghold. Bağcılar also houses a great deal of industry, particularly light engineering, textiles, printing (Bağcılar is home to all the biggest of Turkey's newspapers and TV channels), a huge wholesale market for dry goods, a large second-hand car market, and many trucking companies, particularly along the Gunesli link road from the TEM motorway to Istanbul airport. A metro is being built which it is hoped will ease the constant stream of slowly circulating traffic. 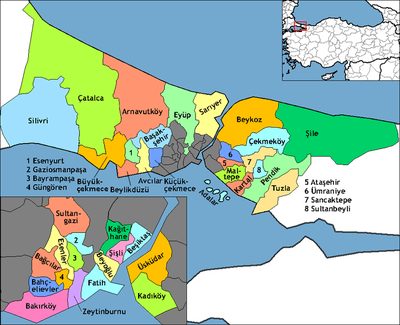 "Historical Background of Bağcılar District" (in Turkish). Governorship of Bağcılar, Istanbul. 2009. Archived from the original on September 6, 2009. Retrieved 2009-08-26. "Geographical Information on Bağcılar District" (in Turkish). Governorship of Bağcılar, Istanbul. 2009. Archived from the original on September 6, 2009. Retrieved 2009-08-26. "Detailed Numerical Information about Bağcılar District". Municipality of Bağcılar, Istanbul. 2009. Retrieved 2009-08-26. Wikimedia Commons has media related to Bağcılar.